I wanted to post this sooner, but a post that has been waiting 8 months for me to complete for once had to take precedence. And although I could have included this there, it would've been buried and it's bad enough how long that last post is! Schedule 1EV is complicated! Anyway, I digress. The point is, now you can get a rough estimate of how much it will cost to charge your vehicle under Dominion's new EV rate programs. Simply visit the this site and enter information about your vehicle, the length you typically drive and how you plan to charge. Dominion offers 3 vehicles in their HTML application: the Ford Focus Electric, the Nissan LEAF and the Chevy Volt. In terms of charging, you choose between your standard wall outlet running 120 V, which you would typically connect to via the car's included EVSE, or 240 V which assumes you already have an EVSE pre-installed which is set up to use the higher voltage. Finally, you can set the time to start charging. Personally, I like to work backwards from the end since I know when I need my car by, but even cars like the LEAF don't let you do that so the start time is quite reasonable, even if it does mean I may not be taking full advantage of all 4 hours of super-off peak. One final note should be made of the Ford Focus Electric cheating with it's expected range numbers. This time last year, the LEAF was rated at 100 mi per charge and many of it's promotional materials still maintain that. The EPA, however, though on an environmental penalty of about 30% when they derived the 73 mi per charge rate used by the Dominion calculator. The Ford Focus has yet to be tested by the EPA and thus it's marketing of 100 mi per charge is taken as an official value, making it look like a more efficient car than the LEAF. The truth is, when the EPA evaluates the Focus it will likely receive a grade of about 70 – 75 mi per charge with its 23 kWh battery as opposed to the LEAF's 24 kWh pack. 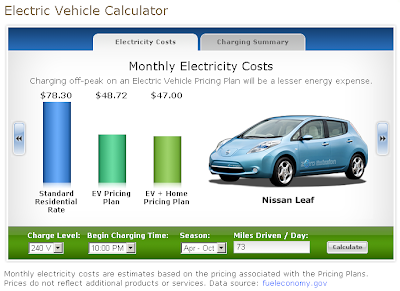 The Volt values are also based on their EPA evaluation.